Roll out both pastries and use one to line the bottom of your pie pan. Put the pie pan and the remaining pastry in the refrigerator. In a small saucepan, melt the stick of butter over low heat. Add in the flour and stir until it is absorbed and the butter thickens slightly. Stir in the white and brown sugar, water, cinnamon, and vanilla. Increase heat and continue stirring until the goo comes to a boil. Remove from heat immediately and set aside to cool. Peel, core, and slice the apples and place them in a large mixing bowl. By now, the sugar goo should be cool enough to touch, but still warm enough to pour. Dont let it get too cool or it'll be hard to work with. Pour ¾ of the goo over the sliced apples and mix the apples until they are all coated. I just used my hands. Get your egg and seperate the whites from the yolk and discard the yolk. Get your pie plate with bottom crust out of the fridge and give it a good egg wash with the whites. This will help keep the bottom crust from getting soggy. Start layering the apple slices in the pan. Dont just dump them in. Carefully work around the inside of the pan, layering one slice just over the one before it. Pile them a little higher in the middle. Lay out the top crust on a powdered surface and cut it in half down the center. Use a knife with a sharp tip and hold it perpendicular (up and down) rather than dragging it thru the dough. You can make your lattice as thick or thin as you want, but always work from the center out. Now you have two halfs of the top crust. Cut a strip about ¾ of an inch thick from the inside of each half. 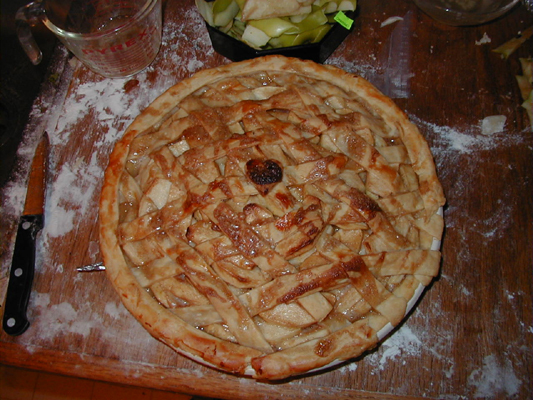 Lay each strip over your pie in the shape of an X. Now cut two more strips, one from the inside of each remaining piece of dough and add them to the pie. Keep going, underlapping and overlapping strips of dough, until it looks the way you want. Trim all the ends off neatly. You'll have a little dough left over, and you can use that to cover the ends of the lattice strips or roll it out and cut shapes out of it and put them on the crust or whatever. I did a little of both...made a crust and added a cute little heart. Take your egg white wash and wash the top pie crust you just put on. That will make it turn a nice golden brown. Take the remaining sugar goo and drizzle it over the top of the pie. That will make it taste good. Take some aluminum foil and wrap just the edges of the crust so it doesnt burn. Stick it all in a preheated 350° oven for 60 minutes. Remove the foil and continue baking another 15 minutes or until the crust is golden brown.